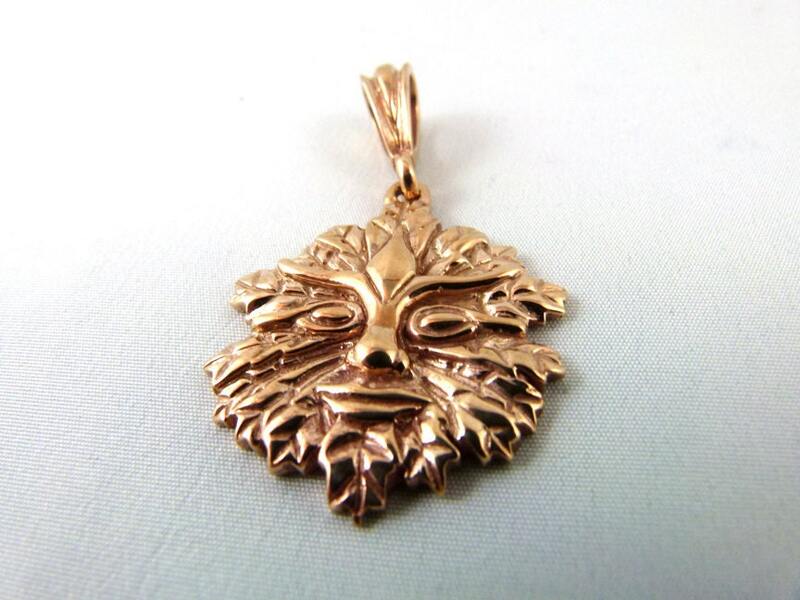 This is my own take on the Celtic green man, an ancient god of the forest whose face is composed of oak leaves and eyes that hold the wisdom of the forest. I spent about 2 weeks researching different styles of the green man, and then after 15 hours of carving, finally created my own. He is about 3.5cm long, and has a relatively hefty weight to him(about 12gms!) The antique bronze is a mixture of copper and tin, so a relatively anti-allergic metal with a look of old gold to it! 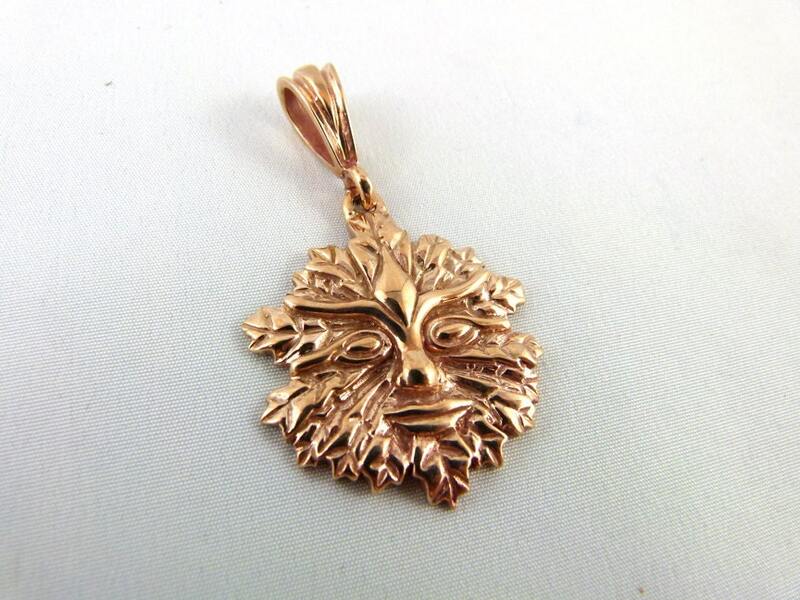 He is perfect for anyone who likes Celtic style jewellery, or even those who want to feel closer to this particular forest god! A Green Man is a sculpture, or other representation of a face surrounded by or made from leaves. Branches or vines may sprout from the mouth, nostrils, or other parts of the face and these shoots may bear flowers or fruit. Commonly used as a decorative architectural ornament, Green Men are frequently found in carvings on both secular and ecclesiastical buildings. The Green Man motif has many variations. 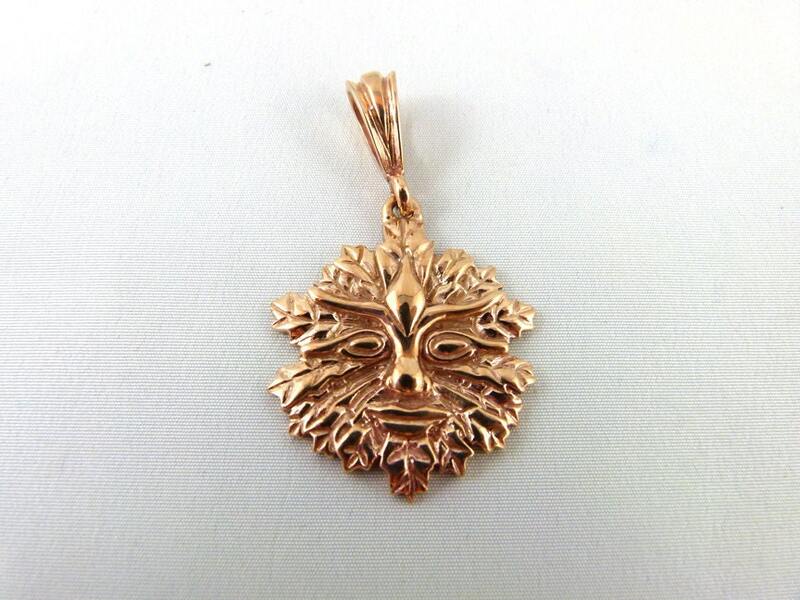 Found in many cultures from many ages around the world, the Green Man is often related to natural vegetative deities. It is primarily interpreted as a symbol of rebirth, representing the cycle of growth each spring. Some speculate that the mythology of the Green Man developed independently in the traditions of separate ancient cultures and evolved into the wide variety of examples found throughout history. For many modern Pagans, the Green Man is used as a symbol of seasonal renewal and ecological awareness. In Wicca, the Green Man has often been used as a representation of the Horned God, a syncretic deity that appropriates aspects of, among others, the Celtic Cernunnos and the Greek Pan. This is a very striking piece. I love it! Delivery was timely. Thank you!